CAN WE PLEASE AGGREGATE ALL PANTHERS DISCUSSIONS INTO A NEW THREAD CALLED "CAROLINA PANTHERS NEWS"
Maybe we won't have the same article shared in 4 different threads. I was at the Wheels Up event in Atlanta before the Super Bowl, while speaking with Kirk Herbstreit (who has a close mutual friend), Coach Rivera came up and started talking with both of us, exchanging pleasantries and College football. I asked him about his thoughts about a new stadium and MLS. He said a new stadium wasn't decided on for certain, but he was very sure that an MLS expansion team is a "done deal". Done deal as in not happening or is happening. ^Humor me people but this MLS team being a "done deal", is this a "done deal" on the CLT side (ie we'll pursue it) or "done deal" with the league itself? I have limited insider knowledge, but what I understand is that Charlotte was always part of the preferred mix of winners. It just didn't have a dedicated voice to champion the cause until Tepper came along. I think its a done deal with the league, its just up to Tepper to bridge the gap with the city/county. I used to work for the Falcons and i have contacts with Atlanta United who felt it was up to Charlotte to get a team if the stadium deal was approved. I think the city/county partnership surrounding Memorial Stadium screwed up that opportunity. Tepper would set up the city and franchise for success. I think the memorial Stadium site would have been the best option, but a shared stadium could be successful as well. Nashville getting a team could have hurt Charlotte's bid slightly. My understanding was Tepper has always wanted an team, and MLS wants Charlotte as a market. The disconnect was surrounding a soccer specific stadium. From what I heard from Rivera, those issues have been assuaged and there could be an announcement of a team in the coming months. The mls idea has a much greater chance of success now because Tepper does have a Stadium already. He would just have to pay the franchise fee and maybe get buy-in from the City/County on upgrades. What rendering? I missed it. It's not in this thread. Strangely, that rendering makes me want to open a BofA checking account....to go along with the 16 others that WF has opened on my behalf. That’s the point! Imagine flying over it! Done. I only found the three topics. Let me know the thread I missed and I'll add it. 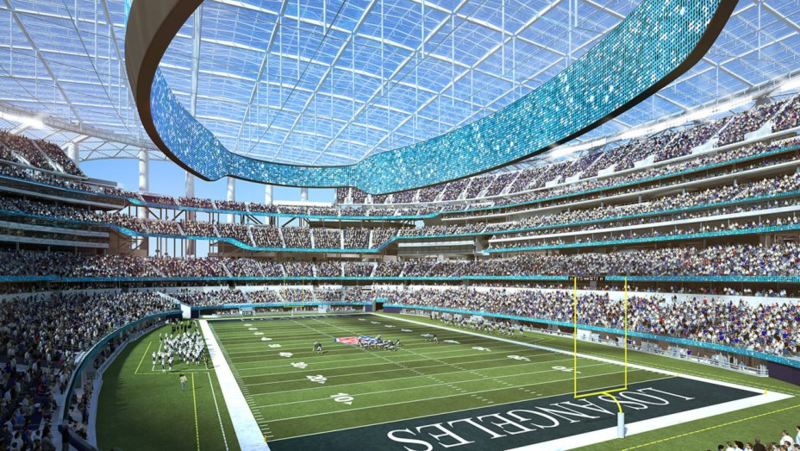 This is a great rendering, good job on it... but I seriously hate domed stadiums. I sincerely hope we never do that to ourselves. Thanks and sooooo many thanks for the aggregating. Agreed. Football is meant to be played outdoors. And the beer tastes better when it’s there to cool you down or warm you up. I enjoyed my beer getting colder in Cleveland. A good short news video on the possibility of adding a roof to BofA. I believe it was an architect from HOK Sport who said it was certainly doable; perhaps it’s the same architect as the one in this video. So yall are ok with snow and freezing temperatures, rain, hail?